"Of all the so-called Hessian units employed by England during the American Revolutionary War none traveled more widely nor had more interesting experiences than the 3rd English-Waldeck Regiment. This contingent of men from the smallest of the six lands (provinces) which provided soldiers for England ­ Anhalt-Zerbst, Ansbach-Bayreuth, Brunswick, Hesse-Cassel, Hesse-Hanau and Waldeck came from the smallest land but served against more nations, in more widely scattered areas, traveled to more places, and suffered a greater percentage of losses than any other contingent." "Originally scheduled to be sent to Canada in 1776, the Regiment was sent instead to New York to join the army of General William Howe. After service in the New York-New Jersey area, during which time men from the Regiment who were captured were sent to prison facilities in Pennsylvania and Maryland and some entered the American Army, the Regiment was ordered to West Florida. En route to West Florida the transports carrying the Waldeck Regiment stopped at Jamaica to regroup and to take on provisions and water. They then sailed to Pensacola. From Pensacola part of the Regiment was sent to the area of the Mississippi river, where the men were captured by the Spanish forces commanded by Don Bernardo Galvez. After being held captive for about a year, the men were transferred to Cuba, sailing first to Vera Cruz, Mexico. Following their exchange, the men returned to New York. Some of the men held prisoner in New Orleans deserted, went up the Mississippi river and joined George Rogers Clark who was fighting against the English in the Illinois country." In one of his letters written while at Lac Témiscouata, Philip talked about his sufferings during the ARW. We have, now, an idea of what he went through while he was a member of the 3rd Waldeck that is deserted in 1778. I don’t have enough information to give you a precise timeline of his whereabouts during the period between 1778 and 1781. Was he a prisoner in Mexico or in New Orleans for a year? Nothing is mentioned in his military file about those events. The military file of those who deserted cannot be as complete as those who returned home. Once again, Philip managed to cover his tracks. But, in 1781, he was part of the West Florida Royal Foresters, a loyalist company that he deserted. How long did he stay with this loyalist company? I don’t know, and, maybe, we’ll never know. 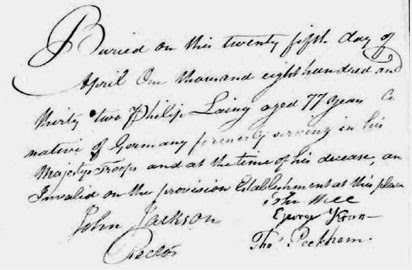 During 1781, he was enlisted in three different companies. In the last two years, stayed in the King’s American Regiment that was in charge of protecting the Loyalists waiting to travel to Canada. There were about 60 Langes in the German mercenary regiments. I will try to find what happened to them, because one of them could most certainly be a relative of Philip and an ancestor of Darl Long from California. Some of these German soldiers have deserted their regiment and stayed in the USA after the ARW. That shouldn’t be too demanding to find with the help of our modern technology. There were also two other German mercenary soldiers by the name of Philip Lange who arrived in Quebec, in 1776. One of them died in the Montreal hospital the same year. The other one, Philip Laing, died much later in Sorel, Qc. But, there was another one by the name of Johannes Lange. He died on the way to America. Here are two records that are probably for the same soldier, Philipp Lang (Laing). 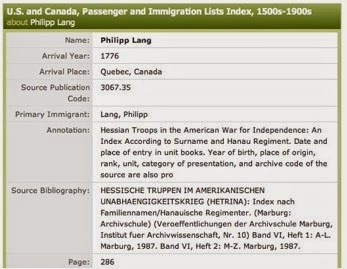 Name of Philipp Lang on a passenger list on his arrival in Quebec. There was a second Philipp Lang during the ARW. He died in 1777. Death record for Philip Laing of Sorel. NOTE. 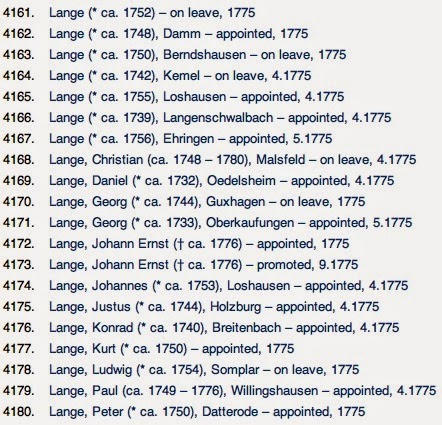 You have surely noticed how the names of these Germans changed once they set foot in America. Most of these names have been taken down by public officials and were, consequently, not written by the soldiers themselves. A soon as Philip entered in a British regiment, his name was « Americanized » to Philip Long. At the census in Quebec City, his name was even written as « Phil Loan ». 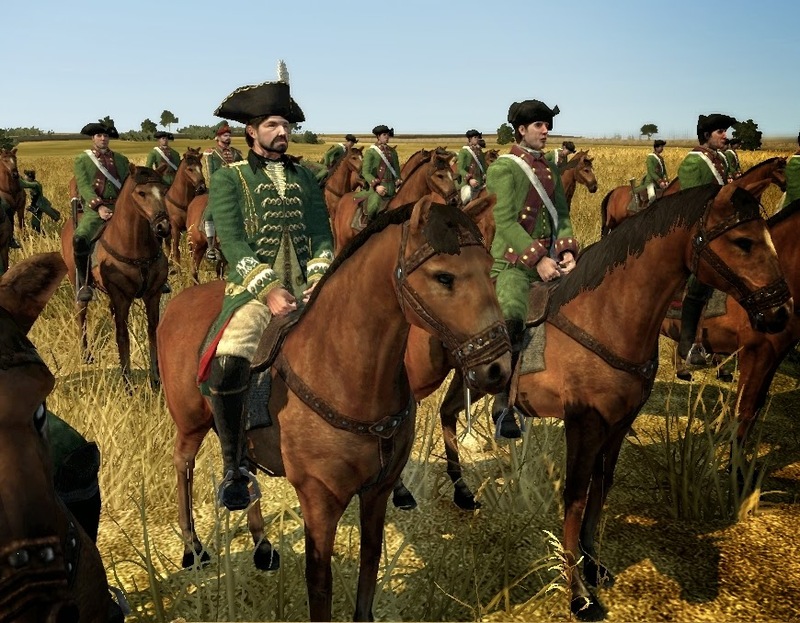 How tall were the Waldeck soldiers? From the book of Bruce E. Burgoyne, I picked up at random 75 measurements that he had noted for a number of soldiers. 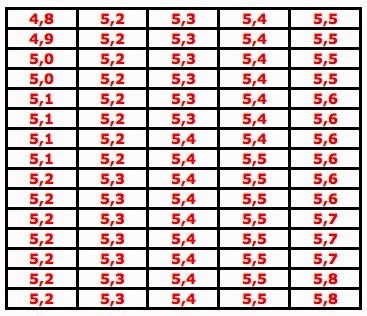 The table below shows the result. On average, the soldiers were 5 feet and 3 inches tall.